Kevin Ridgeway's new poetry chapbook, Contents Under Pressure, took me on a Kerouacian trip through broken appliances, drunken charades, fallen angels, kissing couples, hip-high grasses, mind fucks and sinister grooves with a keen eye and ear. When it was done, all I could say was "Amen! "— and "Again!" So I had to publish it. Available 22 October 2015, Contents Under Pressure features 16 poems on 28 pages, is hand assembled and saddle stitch bound with textured ivory card stock cover, kelly green card stock end papers and white pages. 5.5 x 8.5". Cover image by Steven B. Smith. Only $7 (plus p+h) from Crisis Chronicles Press, 3344 W. 105th Street #4, Cleveland, Ohio 44111 USA. ISBN: 978-1-940996-25-7. 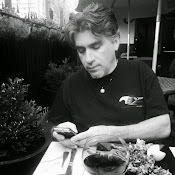 Kevin Ridgeway lives and writes in Long Beach, California. 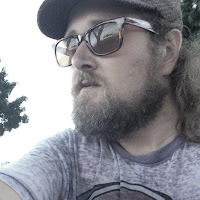 His work has been published widely in the small press, with recent poems that can be found or are forthcoming in Chiron Review, Nerve Cowboy, Lummox, San Pedro River Review, Misfit Magazine, Right Hand Pointing, Bicycle Review, American Mustard and The Mas Tequila Review, among others. He has been nominated for the Pushcart Prize and Best of the Net. 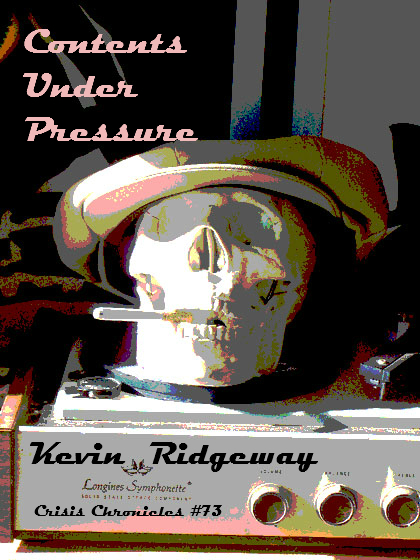 Contents Under Pressure is his sixth chapbook of poetry. Looking forward to it, John and Kevin.